Rowan Dorin (Courtesy of the history department). 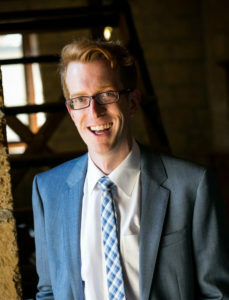 New assistant professor Rowan Dorin joined the history department as a medieval historian of western Europe and the Mediterranean after completing a postdoctoral fellowship at Harvard, where he spent a total of 12 years including his undergraduate and doctoral education. His research focuses on the interaction between law and society as well as the economic history of medieval moneylending and use. The Daily sat down with Dorin to talk about medieval history, his favorite artifacts and his path to academia. Assistant Professor Rowan Dorin (Courtesy of the history department). The Stanford Daily (TSD): What brought you to Stanford? Rowan Dorin (RD): There’s a wonderful community of medievalists, early modernists at Stanford — which is somewhat surprising for what one might expect here in the heart of Silicon Valley — but Stanford really has this extraordinarily dynamic pre-modern community, and so it was incredibly exciting to be invited to join that. TSD: How did your interest in medieval history develop? RD: I started off studying economics, which seemed like a very sensible thing to do as a freshman at Harvard, but I was taking a distributional requirement on the history of the Renaissance and I got invited to go to the Special Collections to handle medieval manuscripts. That was just so much more exciting than anything I was doing in my other classes, and so I tried to resist for a time — I delayed and hemmed and hawed — but I had been bitten by that bug and so there was no going back. So I do my best to ensure that at least in all the classes that I teach now that everyone has the opportunity to go and hold medieval things and handle these manuscripts because there is something pretty numinous. But certainly there aren’t many occasions where you get to hold something that people have held 800 years ago and feel that you’re communing in some way with the experiences of that world. Why the middle ages, though? You know, I like lots of periods of history but for some reason this one just stuck. TSD: Do you have a particular favorite object from the Stanford or the Harvard Special Collections? RD: I have so many now … but my current favorite is a leaf of a manuscript that is written in Arabic using Hebrew characters with Latin scribbles in the margins. It came into the library mis-catalogued, and no one has looked at it to figure out what it is and why so much is going on in these single fragments, so that has been a wonderful treasure hunt for me over the past few months, trying to make sense of this. It turns out that it ends up being partly a recipe book, and so some of the scribbles are things like ‘serve capers with vinegar.’ But we’ll see what more there is to uncover. TSD: How many languages do you speak or read, both dead and alive? RD: So my speaking would basically be English, French, Italian, German — my German is the one that’s feeling a bit rusty these days. For reading, Latin is of course the main one, and then Spanish, Catalan, Dutch and occasionally, with struggle, Middle High German, which sounds as terrifying as it is, and sometimes Middle English and other medieval vernaculars, none of which quite qualify as a full-on language because they’re all related, but they consume my time. And then I spent three years studying Chinese, and I regret to say that I’ve forgotten almost all of it. That I keep 30 volumes of dynastic histories in Chinese in my office is a reminder that once upon a time I could read some of this and one day I’ll be able to again. TSD: How do professors collect so many books in their office in such a short amount of time? RD: So in my case it’s two parts. One, my advisor died unexpectedly when I was in graduate and left me much of her private library. That is an untraditional way, but certainly one of the nice things is that every time I look at my book I think of her. And then there reaches a time when you get tired of fighting over books that get recalled to the library and you want to be able to scribble your own notes in it, and then it just becomes easier — so I spend a lot of time scrounging around used bookstores. The internet has become a very dangerous hobby because of that, because I no longer need to go to the used bookstores — I can just go to the used bookstore websites … That’s a dangerous, dangerous temptation. TSD: As someone who’s been here roughly 10 months or so, can you elaborate on the differences you’ve seen between Harvard and Stanford so far? RD: This is a dangerous question. There was a tour walking through Stanford yesterday and somebody was mentioning “Legally Blonde,” and they mentioned that Elle Woods makes two mistakes, and one of them’s going to Harvard and I almost yelled out ‘Go Crimson!’ but I stopped myself. Weirdly, the quarter system does make a big difference because it encourages students to really try lots of different things that might lie outside their usual comfort zone. Certainly the range of students and backgrounds of students I have in my classes so far has been wonderfully diverse, and a lot of these students may never go on to take another history class, because they’re in engineering or they’re in SymSys (Symbolic Systems) or in any other program, but that’s I think been really striking to me: the degree to which students here are excited to really step outside their comfort zones and the degree to which Stanford really encourages them to do that even outside of the formal requirements. TSD: What is your pitch for medieval history to any student considering a course? RD: For those who have an inkling toward the past, the Middle Ages to me is a wonderful space for grappling with a world — which in many ways shares a lot of institutions and similarities with the present, and that certainly we owe a lot of our modern institutions to — but where the thought processes, the anxieties, the way of piecing together the universe are so radically different. I think that having to try to look at something that, on the surface, looks familiar, and realizing, ‘beneath that is this completely different intellectual universe’, me seems like pretty good intellectual training for a world that is moving awfully quickly and is unlikely to look familiar 50 years from now. So getting used to that, or developing a facility for discarding your initial preconceptions and starting from a different set of beliefs and values, that’s something that all of us right now could use.